Boracay Island is a seven kilometer stretch of tropical paradise in Malay Aklan Philippines. Known for its pristine, white sand home to the best kite boarding beach in Asia, this once remote island attracts millions of visitors from all over the globe every year. Receiving these visitors are two airports in the mainland of Aklan, one is located in Kalibo and the other in Caticlan. The island is not accessible by plane. 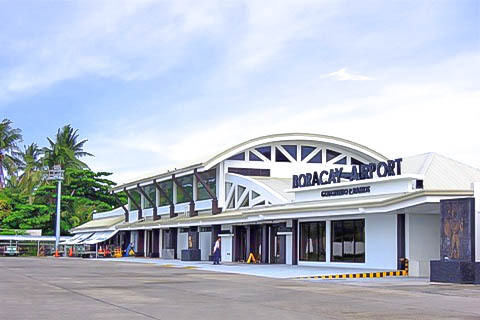 The nearest airport, the Godofredo P. Ramos Airport in Caticlan (also known as the Boracay Airport), is a quick ten-minute boat ride away and caters to flights to and from Manila and Cebu. It is the easiest, most accessible point of landing. Thus, the flights are more expensive than the alternative, Kalibo Airport. Presently, there are only two airlines that fly in and out of this airport, Cebu Pacific and Philippine Airlines. Both airlines allow only a maximum of 10 kilos of check-in baggage. Kalibo Airport now accommodates direct flights to and from Korea and Taiwan daily via Philippine Airlines and Cebu Pacific Air. Tiger Airways fly visitors from Singapore and back on Mondays, Wednesdays, Fridays and Sundays while Air Asia flights in and out of Kuala Lumpur are scheduled on Mondays, Wednesdays and Fridays. Completely different from my last visit back in 1999. We had a wonderful and relaxed time back then. I have heard it was very much over-developed in the last 15 years. Indeed, Boracay has changed over the years. There are now many beautiful hotels that attract visitors and help promote tourism for the island, and for the Philippines. We hope you consider returning to this paradise island soon, and have a wonderful relaxing time as you did back then. This entry was posted on Tuesday, October 7th, 2014	at 2:41 pm	and is filed under Food & Dining, Recent	. You can follow any responses to this entry through the RSS 2.0	feed. You can skip to the end and leave a response. Pinging is currently not allowed.